Harold B. Barclay, geboren 1924 in Newton / Massachusets (USA), arbeitete bis 1948 vorwiegend in der Landwirtschaft. In den folgenden Jahren studierte er Anthropologie in Boston und in Cornell. 1961 promovierte er in Cornell mit einer Arbeit über die Ethnographie eines sudanesischen Dorfes zum Doktor der Philosophie. Buurri al Lamaab, a suburban village in the Sudan. Cornell studies in anthropology. Ithaca, N.Y.: Cornell University Press, 1964. The role of the horse in man's culture. London: J.A. Allen, 1980. 3. Culture: the human way. Calgary. Alta., Canada: Western Publishers, 1986. 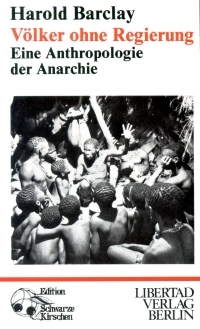 Culture and anarchism. London: Freedom Press, 1997. Longing for Arcadia: memoirs of an anarcho-cynicalist anthropologist. Victoria, B.C. : Trafford, 2005.